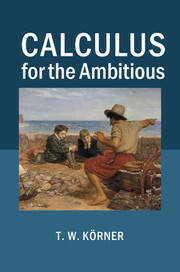 T. W. Körner is the author of Calculus for the Ambitious (2014). He is also Professor of Fourier Analysis in the Department of Pure Mathematics and Mathematical Statistics at the University of Cambridge. His other books include The Pleasures of Counting (1996) and Fourier Analysis (1989).